rongyuanxie has no other items for sale. The E PZ 18-105mm F4 G OSS Power Zoom Lens (SELP18105G) is a wide-ranging zoom lens that provides a 35mm full equivalent focal length range of 27-158mm, covering wide-angle to telephoto perspectives. A constant f/4 maximum aperture offers consistent performance throughout the zoom range and is especially beneficial when working with greater zoom magnifications in low-light conditions. Also benefitting working in dim light or at the long end of the zoom range is Optical SteadyShot image stabilization, which works to minimize the appearance of camera shake by up to four shutter speed steps. Will usually ship within same business day if paid before 15:00 PDT (excludes weekends and holidays). Expected ship time may vary and is based on seller's order cut-off time. I'd watched and read several reviews for this lens. Most were positive, though some not. No doubt, it's not Sony's best lens, but it's very good and suits my needs perfectly well for the price I can afford. I have the kit 16-50 and 55-210 lenses for my A6000, along with Sony 50mm/f1.8 and Sigma 30mm/f1.4 primes. The primes are my favorite and sharpest lenses, but I needed a good walk around lens...and that means a zoom going from wide to some telephoto. This 18-105 gives me the focal range I need. While the f4 isn't in the "fast" lens category, it still does VERY well in lower light (I shoot a lot in nightclubs), and the constant aperture means changing the focal length isn't going to choke my light coming through the lens as I zoom in. I look forward to many years of great photography using this lens and highly recommend it for any A5000/5100/6000/6300/6500 owners. I have two of the Sony SEL E PZ 18-105mm f/4 G OSS (SELP18105G) Lenses. I use this lens on a Sony pwx-fs5 wherever a f4 lens is fast enough, and I use it on a Sony a7sii on a gimbal stabilizer. It is especially nice that the exposure remains constant over the full range of the zoom. The focal length of 18-105 is sufficient on both cameras, particularly since they both have the Clear Image Zoom. In very low light situations I will switch to a faster lens. It would be nice when turning the camera on if the zoom was the same as when you turned the camera off, but it comes on in full wide by default. Over all, very happy with the lens. The Sony 18-105 is a pretty good overall lens. It's a good photo lens and an excellent video lens. The power zoom works well and is very quiet. Photos with this lens will not be at the same quality of a 55 1.8 lens but the overall usability of this lens makes it a great choice for a one and only lens. Sharpness is good with very little CA. The bokeh is pretty good and the image quality is G lens typical....which is better than the standard lenses. Overall build quality is good and the lens is pretty light for its size. The great thing about this lens is its focal length which makes it so useful for most photos and the f stop of 4 which makes it a near great video lens. This lens does not extend like some of the other lenses that are adjustable and that I like. The only problem with this lens is that when you shut the camera off, it reverts back to 18mm and not where you shut it down. There is no indicator other than on screen where the lens is at any moment. If you are looking for a lens that can be your go to every day lens, then this is probably the best choice. It does everything well.....not great but good enough and adjustable enough to make it a good value and a near great lens. 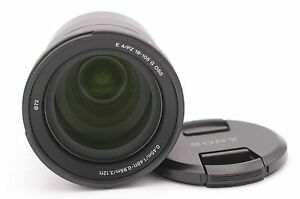 This is the only E mount lens that covers this focal length spread and it overall has very good optics and build. Sure, Sony made compromises and this resulted in some distortion and light fall off on the edges, some CAs for high contrast edges, but the JPEG engine does a good job at correcting all this if set for it in the very fine Nex 6. The lens also is profiled in ACR so you can tweak raw images in Lightroom. I shoot JPEGs with the lens anyhow. The lens rewards with quite sharp images and you should have no complaint there. I also use a 32mm Zeiss Touit with a Nex 6, and although this prime is extraordinarily sharp, the Sony 18-105mm can match its color. This is a sign that Sony was serious about giving the photographer something very important: great color reproduction. For this alone, it is well worth a few tradeoffs. Right out of the camera, the color is terrific. It should be noted that well read reviewers are often quick to offer the limiting factors of zoom lenses versus the prime. This was dispelled a few years back when Olympus offered up the 50-200MM SWD,the 14-35SHG, the 12-60mm SWD, and even their 11-22mm HG. A tad slower than a fast prime,these lenses are simply astonishing in their sharpness. Nostalgia for the old primes, you say? These Olympus lenses have resolution you only dreamed about just a decade and a half back. As for the Sony 18-105mm: if you can't get great images for big prints from it, it's the photographer's skill at fault, not the lens. One final note: You can operate the very quiet power zoom or use the rubber collar. It really is just a matter of what is comfortable and efficient for you. Good lenses for Sony a6000. The a6000 is my #2 of 4 cameras. I like it enough to purchase some additional lenses aside from the two basic zooms. The SELP18105G is a smooth operating, sharp auto zoom. I have used it for stills and video. Although I try to avoid zooming while in video mode, this is an extremely quiet lenses ... much more so than the SELP 1655 stock lense. It looses one "star" due to barreling and pinching at each end of the spectrum. It does seem to be somewhat corrected by the camera. The f4 max aperture is a bit slow and requires an indoor flash. However, it is f4 throughout the entire range of the lense. This is a bonus at 105 mm (154 mm in 35 mm format) I use this system for my easier jobs and it performs well. Buy it ... don't hesitate unless you want the more expensive lenses for this camera. I reserve that money for the DSLR. One more note: this lenses is made in China. Don't be confused by the ads that stay "for Japanese market." That means, made in China for sale in Japan. Weigh the warranty differences before buying.